Footage from decades past, or CGI? Only some can tell. Actors usually aren't the same age as the characters they play. That's just part of the craft. Maybe they're playing the part over a long period of time, maybe they're reprising the part in an earlier time period. But this creates a problem when audiences are expected to believe an actor who is portraying a character who is a good decade or two younger than the actor who plays them. 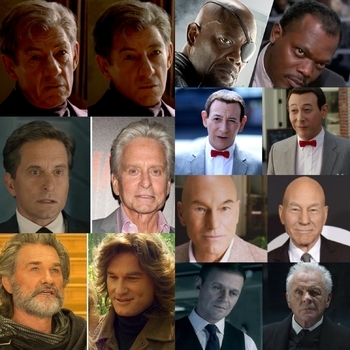 For most of film history, the go-to tool for de-aging an actor has been makeup, to varying degrees of success. But modern innovations in CGI have allowed filmmakers to digitally de-age their actors, by digitally erasing wrinkles, mapping footage from the actor's youth onto the modern face, or some combination of the two. It's often a subtle variation of Serkis Folk - expect set images from films employing this technique to have actors' faces covered in plastic dots. When well-executed, it can be a nearly seamless Visual Effects of Awesome. If done poorly, can be an especially irritating example of the Uncanny Valley. A Kia commercial aired during Super Bowl LII depicts Steven Tyler driving a car in reverse and regressing in age (back to his heyday in the 1970s) in this fashion. In Waterworld, Kevin Costner forced the VFX crew to digitally hide his receding hairline. Pirates of the Caribbean: Dead Men Tell No Tales uses this for a flashback scene of a young Jack Sparrow. In X-Men: The Last Stand, CGI was used to de-age Patrick Stewart and Ian McKellen for a flashback in which they first meet Jean Grey. The Curious Case of Benjamin Button used CGI to make Brad Pitt look both older and younger, depending on the scene. The first major use was in TRON: Legacy, where CGI was used to make Jeff Bridges look as he appeared 28 years prior. Ant-Man featured a prologue where Hank Pym, as played by Michael Douglas, was de-aged to look as the actor appeared in Wall Street. Captain America: Civil War featured a brief scene where Robert Downey Jr. was de-aged to play a teenaged Tony Stark. Kurt Russell was de-aged to appear as a younger version of Star-Lord's father in flashbacks for Guardians of the Galaxy Vol. 2. Captain Marvel was set in the 1990s and used CGI to give virtually seamless de-aged portrayals of Samuel L. Jackson and Clark Gregg as Nick Fury and Phil Coulson, respectively. Terminator Genisys used CGI to have a new T-800 played by Arnold Schwarzenegger face off against one that has aged twenty years. This technique was also briefly used in Terminator Salvation to show a T-800 that has just come off the assembly line. Blade Runner 2049 used this for a scene where a recreation of Rachael interacts with the aged Deckard. Martin Scorsese's upcoming The Irishman will use this for long stretches of its runtime, allowing the septugenarian Robert De Niro and Al Pacino to play characters in their 30s and 40s. The final shot of Rogue One: A Star Wars Story used CGI to make Carrie Fisher look as she appeared in Star Wars. Season 1 of Westworld used CGI in flashbacks to show a youthful version of the character played by Anthony Hopkins. Episode 3 of Twin Peaks: the Return featured a scene where Agent Cooper saved Laura Palmer, with Sheryl Lee made youthful through a combination of CGI and lighting.